my research on Richard Newall, a London merchant, who visited Newfoundland in 1623. This research has uncovered some very interesting stories and this site presents these stories. This site will present the life stories of real people who may or may not be related to me. 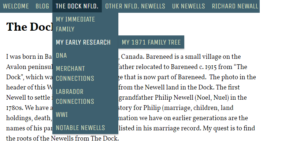 In my quest I have found that prior to 1800 the concept of a family name becomes blurred in the fog of history; therefore, my search includes people with other related family names such as: Newall, Nowell, Knowles, Neville and Noel. There is also a Blog Tab where I will provide information on any updates to the site and where you can leave comments. The Site is still under construction so check back for updates.